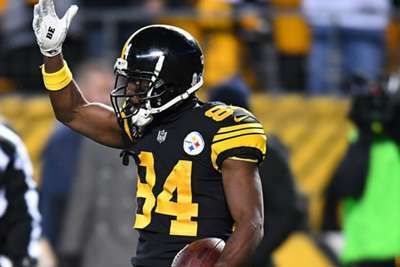 Star wide receiver Antonio Brown did not turn up to the Pittsburgh Steelers' facility on the same day he tweeted a comment about being traded, head coach Mike Tomlin has confirmed. Brown did not show up for work on Monday, a day after the Steelers' loss to the Kansas City Chiefs, and Tomlin revealed he intended to meet with his player on Tuesday regarding his absence. The six-time Pro Bowler looked upset throughout Sunday's game and when a Twitter user suggested his gaudy statistics and contract were the result of quarterback Ben Roethlisberger's play, Brown responded with "Trade me let's find out". Asked whether Brown had been at the Steelers' facility on Monday, Tomlin said: "He was not. "I'm looking forward to visiting with him today and discussing that and some other things. I'm not going to get into the details of why he wasn't here or whether he was excused and all of those things." Tomlin added that Brown had not asked to be traded. The Steelers are already without leading running back Le'Veon Bell, who is holding out having failed to sign his franchise tag offer.